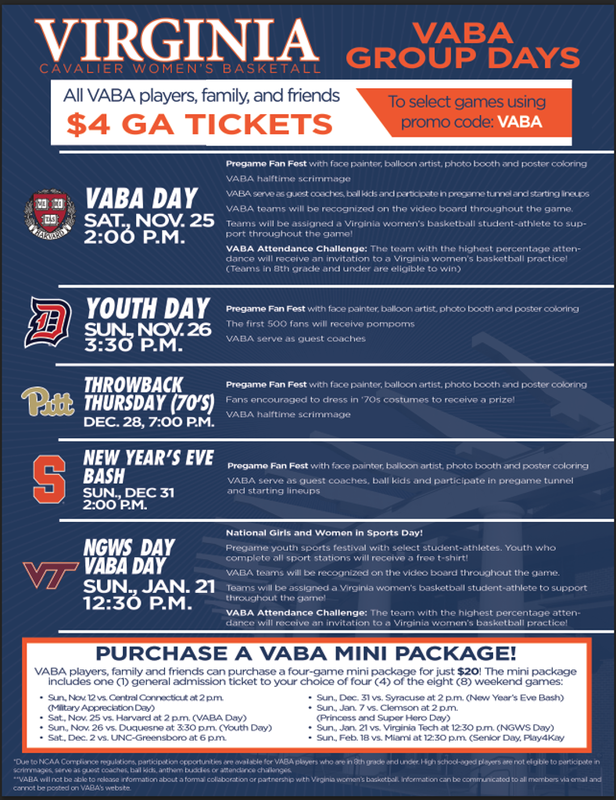 This weekend, on Saturday, November 25 @ 2:00 pm, VABA and the UVA Women's Basketball program, will be officially tipping off our collaboration with an exciting "VABA Day!" Two (2) teams will scrimmage at half-time of the game! Four (4) kids will be ball-girls for the game! Two (2) "Guest Coaches" and two (2) "Guest Players" to sit on the bench during the game. Players and families can purchase $4 GA tickets to these games! USE PROMO CODE: "VABA" to either game - November 25 or 26! To purchase tickets, visit VirginiaSports.com/Tickets, select "Redeem Promo Codes" and enter code: "VABA". This would be a great opportunity to attend as a team and cheer on the 'Hoos. Please forward this email to your families, and encourage everyone to bring a friend or two (even if they are not yet registered for the winter league)! The more the merrier; everyone is welcome! THIS IS GOING TO BE SUPER-FUN DAY TO CELEBRATE VABA GIRLS BASKETBALL AND UVA WOMEN'S BASKETBALL! YOUTH DAY (3:30 pm, Sun, Nov. 26): Pre-game "Fan Fest" - VABA Guest coaches! THROWBACK THURSDAY (Thu, Dec. 28): 70's theme - VABA scrimmage! NEW YEAR'S EVE BASH (Sun, Dec. 31): VABA Guest Coaches, Ball-girls, Participate in pre-game tunnel & starting line-ups! NGWS - VABA DAY! (Sun, Jan. 21): National Girls & Women in Sports Day!...Youth festival, Youth Sports Stations, VABA teams recognized in video board, UVA Women's Basketball adopt a VABA player! VABA Attendance Challenge!